Wicked Student Nights presents the REFRESHERS THROWBACK FESTIVAL! Over 10 Years and 1000s of Events it’s always been our mission to push the boundaries and innovate. We transport you back in time to pay homage to the best era’s of partying bringing you all the way from the 60s where raving began, to the 70s where Hip Hop was born and reliving your childhoods from the 00s over 3 arenas in the infamous and world famous fabric. 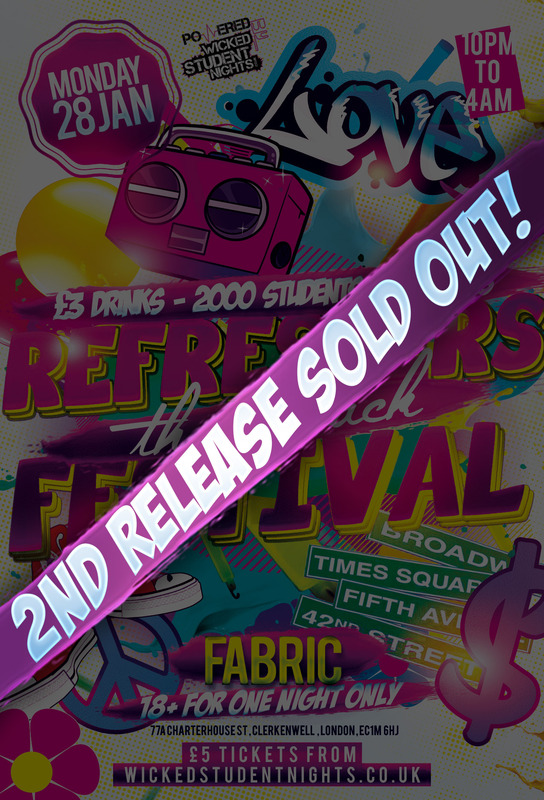 Usually an over 19s venue on the weekend, this is your chance to party in fabric as an 18 year old for one night only! Room 1: The UV Forest Rave Relive the wildest hippy commune as we bring peace love and prosperity, spreading love and laughter. We’ll have 1000s of glow sticks and free makeovers for you ravers to help live the Summer of Love from the 60s and 70s with Special Guest DJs on the controls to keep your feet moving into the early hours. Room 2: Bronx Street Party The Bronx is where Hip Hop was born and raised. Years before Sugarhill Gang, Kurtis Blow, or The Treacherous Three were receiving airplay, Hip Hop was emerging, as early as 1973, at local block parties throughout the borough. So throw on your biggest Gold Chain, Dungaree Jeans and XXXL Tee as we transport you to the origins of Hip-Hop on the Block in NYC. DJs on the decks will be spinning Old Skool Hip Hop and RnB from the Golden Age of the 70s and 80s.